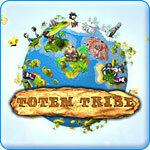 Totem Tribe Game Review - Download and Play Free Version! Fight in a Vast New World to Restore the Glory to Your Empire in Totem Tribe! There isn't a map of any sort to find the hidden jewels on every level so they can be tedious and almost impossible to find. With a burning light in the sky and scorched land, the new Epoch of the Comet has begun and with it comes a threat to the peace which the land has so enjoyed. You must take the role of Aruku, the young woman chieftain of the Hawk Tribe, as she leads her tribe to glory and prosperity all while working to bring back harmony to the planet. Help her along as you travel between 23 different islands and search for jewels, totems, and many other items to aid you in your quest. Construct buildings and units in order to establish a village on each island and explore the mysteries each one holds. Totem Tribe plays like many RTS style games, you start out with a small village consisting of a few huts and the majority of the map is covered by black fog. It is then up to you to build huts to train more workers so that other buildings may be constructed. For example, you can build a barracks to train military units which protect your village or scout lodges to train agile scouts to explore the island. Each building produces a set number of units, such as one hut produces three workers, and they will constantly replenish your forces until this max number is reached. Commands are also very simple to issue since workers automatically go to new construction projects, while scouts and fighters follow flags which you can place anywhere on the map. With a building and research tree as well as main objectives and side-quests for each island, Totem Tribe provides hours of strategy gameplay. You can enjoy the construction and combat parts of the game, and then delve even further to find all the hidden objects which require you to decipher a variety of puzzles and riddles. You will most likely find yourself jumping back and forth between islands in order to solve certain puzzles that require some skill or item which can only be obtained later in the game. 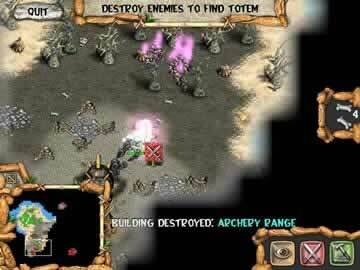 If you like complex strategy games, download Totem Tribe today and lead your people to victory! In Totem Tribe you will be fighting evil mushrooms, overgrown plants with attitude and more all, while searching for gems and lost relics. Solving riddles to find the lost treasure while defending your home base is just the beginning. This real time strategy (RTS) game uses simplified controls so you can spend time trying to find all the treasure on the map and also complete the main missions. RTS games usually require a lot of strategy and planning, but this game is simplified quite a bit so that almost anyone can play. You start with a brief storyline introduction where you are introduced to the main character Aruku, the chieftain of the hawk tribe. Your goal is to bring peace to your tribe. There are plenty of levels to keep you playing for a long time. Each level takes place on a different island and contains an artifact you need to continue on your way. The goals in each level are relatively simple to complete, but there is much more to do in each level if you choose to. Typically there is a treasure chest that requires you find a set amount of an item that are hidden on the island. Once you have collected all the items you can unlock the chest. The chests contain items that will help you complete missions such as “Force of Nature” which can complete buildings as soon as you place them (normally you have to wait for your workers to complete buildings). Main missions involve collecting the artifacts such as the six animal totems. As you progress farther into the game you must complete side missions before you can collect your totem. A bonus mission you can complete is finding all the hidden gems. These are usually strewn about the map, you can also come back later to find these gems. Accomplishing your missions can involve just exploring, but you might also have to fight your way to the goal. You can build various buildings that will automatically produce a set number of troops that you can then control. Controlling your troops is simple, you place the battle flag and all your troops will go to that area and fight everything there. The buildings will continue to replenish the troops as they are killed in battle automatically. Other buildings can be constructed such as defensive buildings, or buildings that provide workers. At first only a few types are available but as you move farther along in the story you unlock more and more. The graphics in Totem Tribe are “cartoony”, but on par with most similar RTS games. There are plenty of plants, trees and rocks to hide gems around. The game does a good job of hiding the gems and other various items so you can find them, but not to easily. Overall the graphics suit the game perfectly. The simplified controls, while good for beginners or younger players, slightly take away from the challenge normally associated with RTS games. None of the characters can be individually controlled. All the workers work on the same building and all the warriors go to the same flag. This limits your freedom to plan out attacks. Also no resources are required to construct buildings or troops. All this simplifies the game to the point where older fans of RTS games might find it too easy. Totem Tribe provides a combination of riddles, find the object, and RTS that will entertain you and keep you busy for many hours. While this game might not challenge a seasoned RTS gamer it would still be entertaining. If you are interested in learning what RTS is about then this game would be an excellent way to start. The entertaining story keeps you thriving to beat the next mission, save the Hawk tribe and find the lost treasures. Check out a variety of gameplay highlights including constructing your village, battling enemies, and collecting treasure.